I have to admit I am not a big fan of Prohaska's ape suits - they tend to be somewhat primitive,crude and ,dare I say, cheap looking. 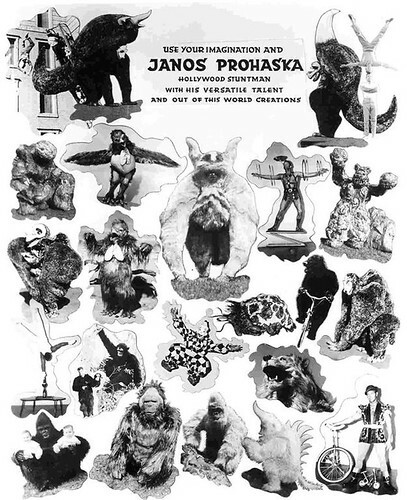 What is made quickly apparent by this promo sheet is the wide variety of creatures he portrayed for film and television. Most gorilla men at some point in their career have hopped into other effects suits or makeup; Corrigan played It from IT! THE TERROR FROM BEYOND SPACE and also tweaked his gorilla suit for FLASH GORDON and UNKNOWN ISLAND, Steve Calvert appeared as a robot in both TARGET EARTH and THE BOWERY BOYS MEET THE MONSTERS, and Charles Gemora played a bear for ROAD TO UTOPIA and manipulated the Martian from THE WAR OF THE WORLDS. However, Prohaska cannot be matched - the man had a virtual menagerie of creatures he created and portrayed, servicing a host of television programs during the 60's and early 70's. In my estimation, Mugato from STAR TREK's 'A Private Little War' is his finest creation - I actually found that damn silly ape suit bristling with spikes and the prominent horn intimidating as a young lad. A plane crash in 1974 killed both Janos and his son, cutting short an impressive career. Below are a few clips of memorable appearances from STAR TREK. Enjoy!